Holy Moly indeed! 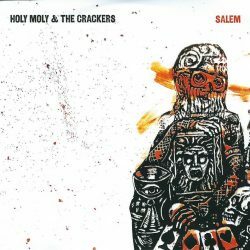 There’s a lot of exciting music on this new release from North East Folk Rockers, Holy Moly and the Crackers, as they move away from their earlier folk-oriented material and explore a darker and more rock influenced direction. This album is a big departure from their previous sound, which was much more rooted in traditional folk rock. On “Salem” they’ve gone for a harder, rockier sound built around a number of songs that are more intense and starker in content than previous work. The results are a bit of a mixed bag – there are some glorious songs on here that really grab you by the throat and pull you in, songs like the opening title track, with it’s story built around the Salem witch trials of the late 1600s but used as a comment on the current rise of xenophobia and hate crimes. Cold Comfort Lane is pretty much a straight rock song that is superbly delivered by Ruth Patterson, lead vocalist and violinist of the band, who brings a real presence to these songs and seems to be enjoying the band’s change of direction. Other stand-out tracks include Hallelujah Amen, with its gospel choir ending and the excellent Mary, which includes the increasingly popular “folk rap” as popularised by Ed Sheeran, but these guys pull it off with panache. Unfortunately, when it doesn’t work the results are a bit embarrassing. Sugar is a dreadful mess of a thing that seems to be an attempt at the sort of song Tom Waites might produce but it misses by a mile; and Woman From Spain sounds like an old Imelda May track before she ditched the rockabilly sound – and she was much more convincing at it than Holy Moly and The Crackers! This is clearly the album of a band in transition and there is a lot to be celebrated in their new sound. Aside from the all out rockers there are another couple of songs that stand out perhaps because they’re not quite such a departure from the band’s earlier music. Easy as the Sunrise and closer Yours to Keep both have great energy without getting over frantic, while reflective composition The Wall has a real sophistication about it, both musically and lyrically. The band do need to give some thought to where their long term direction lies. By all accounts they’ve built up a substantial following on the circuit and some of their longer term fans might find the harder edge difficult to live with – but good bands change and grow and that’s clearly what is happening with Holy Moly and The Crackers, as evidenced in this new album. It will be interesting to see where they go with the next album and whether they sustain this new, edgier style or revert to their more folk oriented material – or maybe even find another direction again. What’s certain is that this is a band that will never be boring. Holy Moly & The Crackers are touring throughout the summer and appearing at a number of festivals. The energy of their new material makes this band look more and more like one to catch live. A band taking an exciting new direction with a collection of harder edged songs.